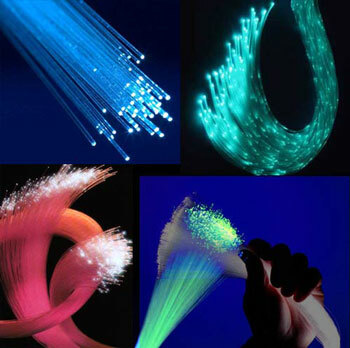 Fiber Optics – Glow with the Flow! The first transatlantic telephone cable to use optical fiber was TAT–8 in the year 1988. If you hear very clear voice over your telephone or see clear pictures on TV, it is not just due to the quality telephone or televisions alone. The crystal clear sounds and images are due to the optical fibers that carry the information through light. Fiber optics or optical fibers (optical fibers) are long, thin strands of very pure glass about the diameter of a human hair. They are arranged in bundles called optical cables and used to transmit light signals over long distances. Inner layout of Optical Fiber How these tiny strands of glass transmit light and how these fascinating strands are made? Let's try to understand it. Hundreds or thousands of these optical fibers are arranged in bundles in optical cables. The bundles are protected by the cable&apos;s outer covering, called a jacket. 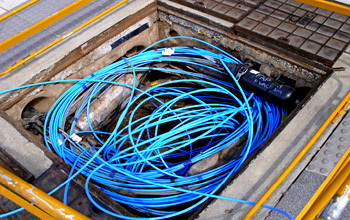 Single-mode and multi-mode fibers Multi-mode fiber has higher "light-gathering" capacity than single-mode fiber. The main difference between multi-mode and single-mode optical fiber is that the former has much larger core diameter, typically 50–100 micrometers; much larger than the wavelength of the light carried in it. Because of the large core and also the possibility of large numerical aperture, multi-mode fiber has higher "light-gathering" capacity than single-mode fiber. 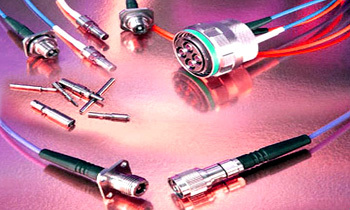 In practical terms, the larger core size simplifies connections and also allows the use of lower-cost electronics such as light-emitting diodes (LEDs) and vertical-cavity surface-emitting lasers (VCSELs) which operate at the 850 nm and 1300 nm wavelength. 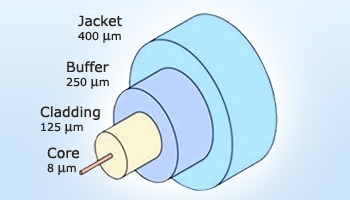 Single-mode fibers used in telecommunications operate at 1310 or 1550 nm and require more expensive laser sources. Some optical fibers can be made from plastic. These fibers have a large core (0.04 inches or 1mm diameter) and transmit visible red light (wavelength = 650 nm) from LEDs. 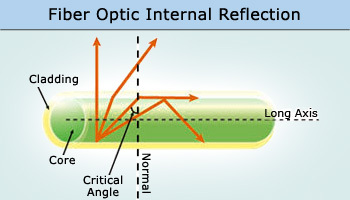 Internal Reflection in Optical Fibers Since total internal reflection takes place within the fibers, no incident energy is ever lost due to the transmission of light across the boundary. The intensity of the signal remains constant. Light does travel in straight lines. Thus when there are bends in wires through which the light travels, there is considerable loss of transmission. Fiber optics uses a principle known as total internal reflection that allows light to travel long distances without any loss. The light in a fiber–optic cable travels through the core by constantly bouncing from the cladding (mirror–lined walls). Because the cladding does not absorb any light from the core, the light wave can travel great distances. However, some of the light signal degrades within the fiber, mostly due to impurities in the glass. The extent that the signal degrades depends on the purity of the glass and the wavelength of the transmitted light (for example, 850 nm = 60 to 75 percent/km; 1,300 nm = 50 to 60 percent/km; 1,550 nm is greater than 50 percent/km). Some premium optical fibers show much less signal degradation – less than 10 percent/km at 1,550 nm. Transmitter Most systems operate by transmitting in one direction on one fiber and in the reverse direction on another fiber for full duplex operation. Optical Receiver Receivers use semiconductor detectors (photodiodes or photodetectors) to convert optical signals to electrical signals. The transmitter is like the sailor on the deck of the sending ship. It receives and directs the optical device to turn the light "on" and "off" in the correct sequence, thereby generating a light signal.The transmitter is physically close to the optical fiber and may even have a lens to focus the light into the fiber. The most common wavelengths of light signals are 850nm, 1,300 nm, and 1,550 nm (infrared, non–visible portions of the spectrum). 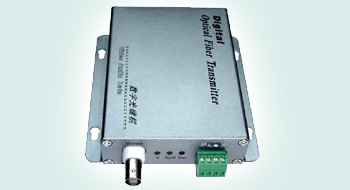 The transmitter gathers and encodes the information and produces the primary signal through the optical fiber. The optical generator acts like a step-up transformer in electrical systems. It magnifies the signal to make up with signal degradation. And lastly, the receiver decodes and receives the information and converts it to a form that could be recognized by the receiver. 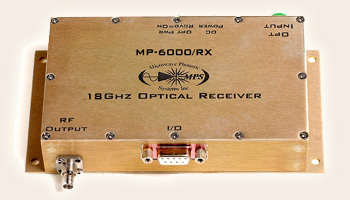 The optical receiver takes the incoming digital light signals, decodes them and sends the electrical signal to the other computers, televisions and telephones. The receiver uses a photocell or photodiode to detect the light. Why Fiber Optics? The main reasons why fiber optics is preferred by telecommunications companies are cost, efficiency and convenience. Less expensive – Several miles of optical cable can be made cheaper than equivalent lengths of copper wire. This saves your provider (cable TV, Internet) and your money. Thinner – Optical fiers can be drawn to smaller diameters than copper wire. Higher carrying capacity – Because optical fibers are thinner than copper wires, more fibers can be bundled into a given diameter cable than copper wires. This allows more phone lines to go over the same cable or more channels to come through the cable into your cable TV box. Light signals – Unlike electrical signals in copper wires,light signals from one fiber do not interfere with those of other fibers in the same cable. This means clearer phone conversations or TV reception. Low power – Because signals in optical fibers degrade less,lower–power transmitters can be used instead of the high–voltage electrical transmitters needed for copper wires. Again, this saves your provider and you money. 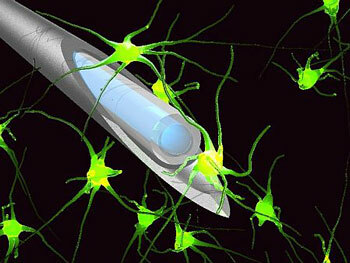 Use of Fiber Optics in Medical field A single multimode fiber serves as an in vivo neuroimager; image information carried by its multiple modes is unscrambled by a spatial light modulator at the other end of the fiber. Non–flammable – Because no electricity is passed through optical fibers, there is no fire hazard. Lightweight – An optical cable weighs less than a comparable copper wire cable. Fiber–optic cables take up less space in the ground. Plumbing – to inspect sewer lines. Fiber Optics in Telecommunication Because of its advantages over electrical transmission, optical fibers have largely replaced copper wire communications in core networks in the developed world. Fiber–optic cable is used by many telecommunications companies to transmit telephone signals, internet communication, and cable television signals, sometimes all on the same optical fiber. The optical fiber can be used as a medium for telecommunication and networking because it is flexible and can be bundled as cables. Although fibers can be made out of transparent plastic, glass, or a combination of the two, the fibers used in long–distance telecommunications applications are always glass, because of the lower optical loss. Both multi–mode and single–mode fibers are used in communications, with multi–mode fiber used mostly for short distances (up to 500 m), and single–mode fiber used for longer distance links. Because of the tighter tolerances required to couple light into and between single–mode fibers, single–mode transmitters, receivers, amplifiers and other components are generally more expensive than multi–mode components. Fiber Optic Temperature Sensor Optical fiber sensors for temperature and pressure have been developed for downhole measurement in oil wells. The fiber optic sensor is well suited for this environment as it functions at temperatures too high for semiconductor sensors. Optical fibers are small and useful in areas where electrical power is not needed. Hence they can be used as sensors to measure strain, temperature, pressure and other parameters. Optical fibers are used for seismic applications. Hydrophone systems with more than 100 sensors per fiber cable have been developed. Hydrophone sensor systems are used by the oil industry as well as a few countries navies. Another use of the optical fiber as a sensor is the optical gyroscope which is in use in the Boeing 767 and in some car models (for navigation purposes). Hydrogen microsensors also deploy optical fibers. 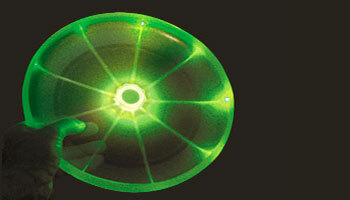 Flying disc illuminated by optical fibers Its key innovation is housing a super bright LED in the center of the disc, and using fiber optic channels to bring light to the rim. This allows maximum protection to the LED, and produces a rim without the protruding LEDs found on other lighted discs. Fibers are widely used in illumination applications. They are used as light guides in medical and other applications where bright light needs to be shone on a target without a clear line-of-sight path. In some buildings, optical fibers are used to route sunlight from the roof to other parts of the building. Optical fiber illumination is also used for decorative applications, including signs, art, and artificial Christmas trees. Swarovski boutiques use optical fibers to illuminate their crystal showcases from many different angles while only employing one light source. Endoscopy Imaging Fiber optic endoscopes, composed of multiple hairlike glass rods bundled together, can be more easily bent and twisted. 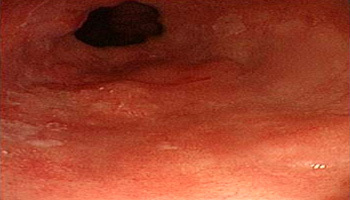 The intense light enables the endoscopist to see around. Optical fiber is also used in imaging optics. A coherent bundle of fibers is used, sometimes along with lenses, for a long, thin imaging device called an endoscope, which is used to view objects through a small hole. 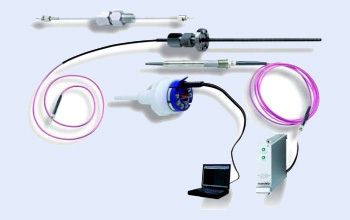 Medical endoscopes are used for minimally invasive exploratory or surgical procedures. Industrial endoscopes (fiberscope or borescope) are used for inspecting anything hard to reach, such as jet engine interiors.